Tiny and Big in Grandpa’s Leftovers tackles a classic story about inheriting the legacy of past generations. But in this case it isn’t a father’s shoes the characters have to fill, but rather their grandfather’s underwear. It’s not just any pair of undergarments, but underwear that grants mystical telekinetic powers. Yes, it’s a strange story, but it also wraps around a really fun platformer. You step into the pants of Tiny, a technophile on a quest to reclaim his family’s legacy from long-time bully, Big. To achieve this aim, Tiny equips himself with a rock-cutting laser, a grappling device and rockets to push objects out of the way. German developers Black Pants Studio built Tiny & Big from the ground up with mechanics designed to slice apart and catapult giant objects around the virtual space to progress through the game. Tiny’s laser drives the action, as he cuts pieces of the scenery apart to bridge gaps and move around levels. There’s a real gleefulness to letting Tiny dissect cliff faces for the joy of seeing giant rocks fall and smash into the ground with giant comic-style “GENASH” sound effects popping up. There will be points at which you’ll carve up sheer walls like Thanksgiving turkeys to create piles of traversable rubble. The laser geo-modding, grappling and rocket mechanics blend smoothly together like tasty Neapolitan ice cream, giving plenty of options to take on problems with different methods. It’s really satisfying to see Tiny grapple-hook a stone column, then slice it in half to send a piece of the pillar spiraling to the ends of the level. Despite his size, the magnitude of his impact of the environment ramps up the engagement factor. As he slices off a chunk of stone slab to create a makeshift bridge, there’s something awe-inspiring about watching Tiny take on such a grand scale world, and it’s very entertaining to play. Once you really get in the groove of the game, you can create your own columns on the fly, rocketing them into place and jumping off the stone slabs just in time before they go tumbling in the void. This process is extremely satisfying and there’s a huge replay factor that encourages you to repeat levels again and again to see what other carvings you can sculpt. Given the dazzling mechanics on display, one could almost call it a glorified tech demo, but the key word is “almost.” Tiny & Big’s unique art style and goofy pants-centric dialogue really improve the overall game. Visually, it doesn’t look too far off from the likes of games like Psychonauts and the aesthetic complements the zany jokes and gameplay. And the collectible tapes add mellow, indie music to your radio’s song library that put you in a good frame of mind. The entire game takes place in a giant desert, but fortunately, Black Pants has taken advantage of the environment to create a world that’s so much more than just sand and cacti. 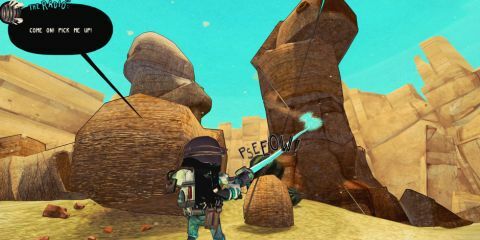 The comic book-inspired sandy art, minimalistic music, and the dumb-as-rocks characters contribute to the arid, desert feel to the game. Dazzling gameplay and presentation aside, there are a few elements that hold Tiny & Big back. The giant rocks are sometimes difficult to manipulate and sometimes you will accidentally push them when you want to rotate them. The fall distance that can kill Tiny is a less forgiving than we’d like. And there are a few times when the game doesn’t recognize your cuts and you will be smushed unfairly. But auto saves are frequent enough that it isn’t too much of a hassle to retrace your steps. And the game is fun enough that you honestly won’t mind playing a section again. Tiny & Big also touts a short run time, lasting only about 4 hours or so. The length is a mixed blessing, since the pacing is really tight, even if we wish the game was longer. Fortunately, Black Pants has labeled Grandpa’s Leftovers as “Episode One,” so hopefully we will be getting more sooner rather than later. Tiny and Big: Grandpa’s Leftovers is a fabulous, unique gaming experience powered by a fantastic gameplay hook. Tiny’s tools are really fun to play with, and the game is wrapped in a beautiful, hip aesthetic. It’s a unique platformer that provides mechanics we haven’t seen executed this well elsewhere, and considering the single-digit number of the Black Pants Studio team members, it’s even more impressive. Tiny & Big may be a tiny package from a tiny team for a tiny price, but it packs a huge wallop. Description Tiny is trying to get his Grandpa's underwear back from his long time bully, Big. He uses his laser to cut, grapple device to pull the pieces apart, and his rockets to send the fragments flying into space. That is if Big doesn't smush him first.